There are few drinks as revitalizing and as refreshing as a cup of tea. Cups of tea are a great source of caffeine and a perfect pick me up for anyone feeling sluggish or tired, but aren’t as dehydrating and ‘harsh’ as coffee. These are drinks that you can enjoy in the evening, and that are perfect for enjoying with company, and there is a whole culture built around their consumption. However when most of us think of tea we think only of the traditional black tea, and probably with milk. Not half as many people have sampled the wonders of green tea though they might know that it’s in some ways actually healthier. 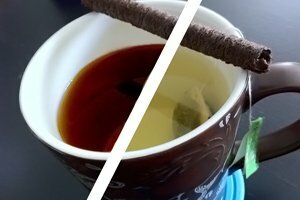 Here then we will look at what the difference is between black tea and various green teas. Both green tea and black tea come from the same planet – ‘Camellia Sinensis’ – but it is the preparation which alters the result. Black tea is so named because of its dark hue of course. This is caused by the processing, and black tea goes through more processing than the other kinds. First the leaves are left in the sun to wilt, and then they are rolled in order to break open the tissue and ferment as they react with the air. This causes the color of the leaves to change gradually from green to red and then black, and after this process has been completed they are dried and packaged. The process of making green tea is slightly different. Here the tea leaves are steamed or pan fried and they do not go through the fermentation process. The leaves are then dried out and sometimes rolled into various shapes before being sold. Because the frying or steaming is a much quicker process than fermentation this means that lots more of the active ingredients remain intact and also affects the taste. Green tea and black tea then of course taste slightly different. Black tea is a slightly stronger tasting tea and thicker, and is often consumed with milk to give it a more creamy texture and to water down some of the caffeine. Green tea meanwhile is more ‘light’ in taste and much fresher. Some describe it as being almost grassy, but it is possible to get flavored green tea and sweet varieties. It is not normally served with milk or sugar. Green tea contains less caffeine than regular tea and this can have some benefits depending on your reasons for drinking tea. The fact that it contains less caffeine means that you won’t get as much of a kick or a buzz from drinking it, which may make it less useful for those looking for a pick me up. However for others who are concerned about drinking too much caffeine, or who suffer from jitters, headaches or insomnia as a result of consuming it, this can be a positive thing that can help you to maintain your health well. Caffeine has a range of advantages and disadvantages. It is a stimulant meaning that it will boost your energy levels and your heart rate, and this not only helps keep us awake and encourage focus but also helps us to burn fat and increase our metabolism. However the downsides are that an elevated heart rate can also be a bad thing if you have high blood pressure for instance or a bad heart, and it can also make sleeping difficult, cause jitters and nerves and result in headaches. By drinking green tea then you can benefit from a milder form of caffeine with fewer nasty effects. At the same time though, green tea also contains polyphenols which further aid the metabolism. The other good news with green tea is that it contains more antioxidants and these have impressive anti-carcinogenic effects. Antioxidants work essentially by neutralizing the free radicals that are lose in the body, and which can cause cell damage when they collide with cell walls. Eventually too much bombardment from free radicals penetrates the cell wall and damages the crucial nucleus of the cell containing the DNA. This can then warp that DNA causing genetic mutation which spreads as cancer. While there are many forms of antioxidant that we all get in our diet, green tea contains ECGC which is one of the strongest and most effective. Additionally green tea contains catechin which destroys bacteria in the stomach. This helps to avoid illness, and it has also been suggested that green tea can help prevent indigestion. The heat from drinking hot water is also a benefit in all forms of tea. This can help to burn fat as the body uses energy in bringing the body temperature back down. At the same time though it can also help to kill off bacteria, though drinking it too hot may cause damage to the mouth. Lastly, green tea has the advantage over black tea that it doesn’t as badly stain the teeth – a big problem for image-conscious tea drinkers.